WARNING! As the title of this document suggests, visiting the Unknown Planet is a Point of No Return. All other planets become unaccessable, and thus any purchases you wish to make, any side-quests that you wish to finish should be completed before this. Also note that money has no meaning or value once you reach this point, therefore it is advisable that you spend all of your credits before coming here. If you have extra credits and nothing else to spend them on, you can always buy Computer Spikes and Adhesive Grenades. These will come in handy later on (though any more than 200 spikes or so will be wasted, even with no ranks in computer use). Also before proceeding if you have yet to do so it is in your best interest to go to the Yavin Station and finish off the Tradoshans. You may have to enter and exit your ship several times if this is your first visit, to get all of the dialog until you finally are able to battle the Tradoshans. Afterwards you can barter with Suvam for his premium items. Remember money is of no worth so it is best to spend it here of all places. In any case, once you are ready proceed to the Unknown Planet and watch the ensuing cut-scenes. After another brief gunner station mini-game, you'll arrive on the Unknown world. After finishing with all of the dialog (a few LSP & DSP options available here), prepare for battle and leave the ship. 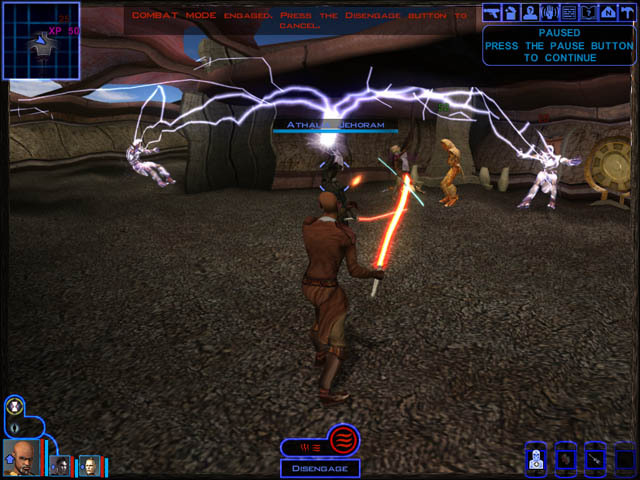 When you move forward a cutscene will ensue and a group of Rakata will attack. After taking these guys out, you have a chance to explore. To the south is the path to the Ancient Temple, while to the north lies the North beach. Your primary goals are to find replacements parts for your ship, and to enter the Ancient Temple to turn off the disruptor field. The first is done very easily, you can find the parts laying about in the South Beach Area, behind some plasma mines vents. Take the parts and return to the Ebon Hawk, and click on the Hyperdrive for 1000 XP. Simple. The second goal isn't quite so easy, and can only be accomplished with the help of either the One and the Black Rakata (dark path) or the Elders (light path). No matter which you decide to go with, you will want to pay "The One" a visit (you can only finish the Mandalorian Quest if you do this). Promise or lie to him that you'll help him out for 1000 XP. Afterwards, loot the place and talk to the Loremaster Gjarshi who is in one of the rooms to the East (The one farthest from "The One"). Talking to him about the history of his people and completing all dialog options nets you 1600 XP. Once this is done, you'll have to make a decision as to whether you want to support "the One" or the Elders. If you are going to side with the Elders, go ahead and go back in and tell "the One" that the deal is off. That will cause him to release four Rancor from their cages and also makes everyone hostile. This is actually one of the few places where mines can be used rather effectively by setting them around where the four Rancor will wind up, though there isn't much point as you should be powerful enough to eliminate any opposition with little difficulty. Clear the area (killing "The One" nets you 1000 XP) and then talk to the Red Rakata who was in one of the cages with the Rancor. He'll be grateful and run for another 1000 XP. You can actually gain an extra 1000 XP by talking to the Elders before coming back to rescue the prisoner, but personally I don't think it's worth it, especially since all of your characters should have reached level 20 by now, or will very soon, making XP meaningless. Anyways, it's time to head on over to the Elder's Settlement. When you approach the entrance, a hologram will appear. Do NOT mention being sent from "the One" or the other Rakata, or you'll end up fried to a crisp. Enter the Compound, and if you didn't kill "the One" earlier, you'll have the chance to slaughter the Elders now if you wish. If do kill the Elders off, make sure to loot Keeper Orsaa's corpse for a copy of the Ancient Tome that "The One" wants. Take the Tome back to "The One" for 3000 XP, and he'll agree to have his Rakata perform the ritual to allow you into the temple, though you will have to enter alone. If you didn't kill off the Elders, you can convince them to help you if you rescue one of their scouts, which you should have done already. After this you'll have free reign over the compound, so go ahead and loot all the bins here and talk to Keeper Orsa in the back for 500 XP. In either case once finished head on over to the Temple Compound alone. Once inside you cannot exit until you've completed everything here, so get ready for a long stay. If you're following the dark path you'll want to unequip Carth of anything useful before entering the temple. Talk to the Rakata there, and Jolee (and Juhani if she's still alive that is) will come running and force themselves in your party, after which you enter the Temple (and watch another cutscene). Once inside you need a way to open the doors right in front of you so that you can go to the Temple Summit where the computer that controls the disruptor field is. And the only way to open these doors, is to go to the catacombs. This is why the Rakata Empire crumbled, a poor architecture. Har. Anyways, to get to the Catacombs just walk to the east end of the temple, killing enemies as you go, and enter the doors there, killing the two prototype droids guarding that area. Exploring the side passages here can get you a few nifty items, such as the Upari crystal off the corpse of one of the Dark Jedi here, so you may want to do that before heading down. Once downstairs, go forward and take out the two guard droids hanging down here. Proceed forward, and in the next room you'll come across a "puzzle". I use the term puzzle for lack of a better word. The solution is found in the footlocker we just past. Anyways, to open the next door you need to walk in the pattern of an H. If you're having problems walk, don't run. Oh, and make sure your companions don't follow you, since they can get in the way. Anyways, once that is done proceed forward and use the computer. Talk to it (yes it talks), and have him open up the way to the Summit, but asking how to turn the disruptor field off. You can talk to it about various other things as well, if you wish. Once you've finished with the computer head up back up to the main floor, and over to the west doors, near the entrance. Open it up and find another pair of droids blocking your way. Don't worry though, one blast using destroy droid should wipe them off the face of existence. Head on up to the summit to face Aribeth Bastila. Gasp! She's turned to the Dark side. Oh darn! Teach her a lesson in humility (I know you've been wanting to do that ever since you first met her.) She's very easy to defeat, and should go down without further ado. Anyways once her health is down to half, the script kicks in and you all get pushed back. She starts blathering on again about you being the Dark Lord of the Sith. This dialog has TONS of places to earn both DSP as well as LSP, but eventually the last choice you are left with is to either Slay the Water Dragon I mean, ahem, become the Dark Lord of the Sith, and plan to re-take the Star Forge, OR to deny the dark side and help the Republic destroy the Star Forge. Either way you'll get 4000 XP, though this last choice nets you huge amounts of DSP or LSP. Check out the bottom of this page for details. If you side with Bastila, you'll have to kill Jolee (and Juhani if you didn't squash her the first time around), though Bastila will be on your side, and back at full health (and you'll gain her inventory too, pathetic as it is). Eliminate all those that oppose and return triumphant to your ship. At this point you can return to "The One", if you sided with him, and then tell him off, to have all of them become hostile towards you. This allows you to eliminate any remaining Rakata if you wish. On the other hand, if you sided with the Elders, you can only eliminate them if you reclaimed your role as Dark Lord of the Sith, and sided with Bastila. Anyways return to your ship, and if had sent Bastila packing you'll have a tearful reunion at your ship where you tell them that Bastila was too weak to resist the Dark side. No surprises there then I guess. If she joined your party, you'll have to break the news to the rest of your minions. Canderous and the droids are okay with it, HOWEVER you get to deal with Mission and Zaalbar in a less pleasant fashion (but loads more fun!). Carth runs off screaming like a girl (what else did you expect from this whiny loser?) so you won't be able to off him unfortunately. The best way of taking care of Mission is by force persuading Zaalbar to kill her (you'll need dominate mind to do this though). Fun times. You'll get 1100 XP for tasting the sweet joy of finally being able to mow that snobbish brat to the ground. Note that if you fight Zaalbar and Mission, they'll drop any items they were equipped with, though if you force Zaalbar to kill Mission, her items will automatically be added to your inventory again. Anyways, whatever happened at the beach make sure you've taken care of all business here, enter the Ebon Hawk, and take off for the Star Forge! Overall: Very Easy. At this level, the enemies are pathetically easy. Consulars decimate whole groups with two or three castings of either force wave or force storm, while the Melee builds are equally good at dispatching the enemy, slicing through any opposition. Melee builds may find it easier to handle the Rancor, though the masses of rakata are more easily dealt with by the consulars. The Elder Councillors actually have a high innate resistance to force powers, so they may give you a hard time if you're a consular. Throw lighttsaber and thermal detonators may help with these three. The rest of the compound be a piece of cake. 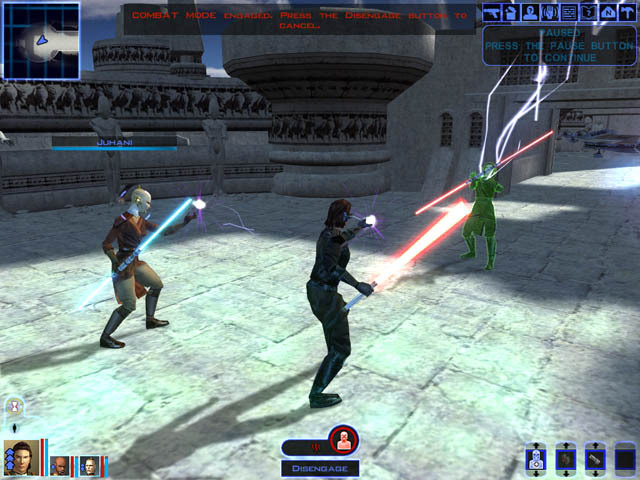 Another place where you may have some difficulty is when you battle against Jolee and Juhani (if choose the dark path). They can be quite a handful, especially if you built them well. Consulars will probably have a harder time than melee builds, as the damage you can deal vs individuals in Melee is far greater than any force power. Besides these small obstacles, nothing should even give you pause at this stage. Not a single character died while on the Unknown world. Talk about a walk in the park.